The Union Jack on the Jack-Staff of HMS M. 33, Portsmouth Historic Dockyard, Portsmouth, 29/08/16. “Controversy persists about whether the British national flag should be called “the Union Flag” or “the Union Jack”. Among those who are informed about the matter, it is generally accepted that either name may be used. However, some people are convinced that “Union Flag” is the only correct term and that “Union Jack” should be used only when the flag is flown from the jack-staff in the bows of a Royal Naval vessel or, at least when it refers to the use of the flag by the Royal Navy. The general public almost universally uses the term “Union Jack”. Today some people claim to perceive that this usage is being eroded by persons who deliberately adopt an unjustified pedantry. It must be acknowledged, however, that the origins and relationships of the names “Union Flag” and “Union Jack” are historically far from clear“. I suppose, as I have previously refereed to Union Flags hanging from buildings I have photographed on my travels, I should refer to this as a Union Jack, especially as it is being flown from a “jack-staff in the bows of a Royal Naval vessel” – but I could be wrong. The M. 33 has made an appearance on the Antic Roadshow, back in 2014, so if you would like to see what it looked like then or learn a bit more about its history follow this link. 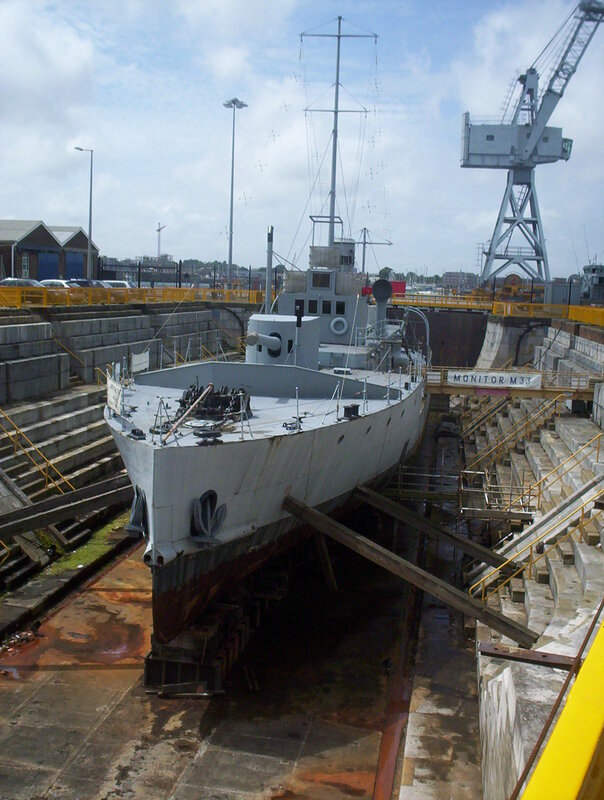 Photo Archive: H.M.S M33 Monitor, Portsmouth Historic Dockyard, 2005 and 2013. On my first visit to Portsmouth Historic Dockyard, a must for anyone on a coach holiday to the Hampshire coast, I took the time to take the photograph above and wonder, for a moment, what brought this little ship to a dry dock, overshadowed by the Royal Navy’s largest ships, past and present. Then it was off to queue up for a tour of Nelson’s famous and instantly recognisable flagship, H.M.S Victory. Then I forgot about the little ship (and this photograph; until last week). Last year I made the journey from Southampton to Portsmouth, by train this time, to visit the Historic Dockyard again, to see the new museum built around the remains of the Mary Rose. On a strict timetable (I think I had to present myself at the Mary Rose Museum at 11 o’clock) I marched from the dockyard entrance to H.M.S Victory, looking for something to occupy my mind and the 15 minutes remaining on the clock before I had to join the queue. Then I noticed the little ship; resplendent in its new, dazzling, paint work! The notion of dazzle camouflage schemes were not new to me, but I had never see them applied so boldly and on an object in front of my very eyes. The idea is, in short, that when your German Imperial Navy U-boat Commander looks at the H.M.S M33 through his periscope he is dazzled by the bold, black and white pattern and subsequently doesn’t know where to aim his torpedoes, because he can’t tell one end of the ship from the other. As you can see, this was a very quiet corner of the Historic Dockyard and I spent some time strolling around the M33 and admiring it’s obviously very new paint work. 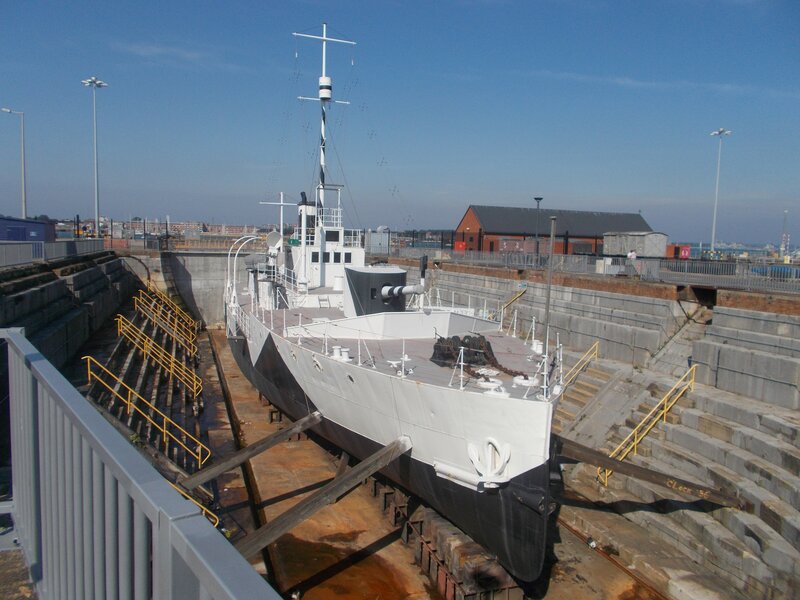 I learnt from a leaflet that I picked up later (that I have subsequently filed away somewhere so “safe” I cannot find it) that the warship is own by Hampshire County Council and that they have further restoration plays for it. I also learnt that this “little ship”, as I refereed to it initially, had seen action at Gallipoli in 1915 during the First World War and had supported White Russian and Interventionist British forces during the Russian Civil War in 1919. 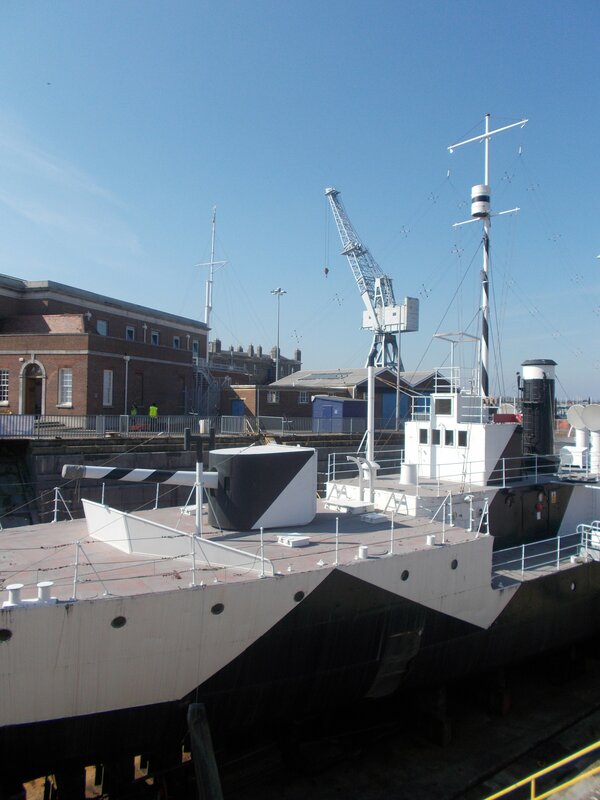 Perhaps my next visit to Portsmouth will be especially to see the newly opened H.M.S M33 Monitor; next year perhaps, to coincide with the anniversary of the Gallipoli campaign. We’ll have to wait and see.